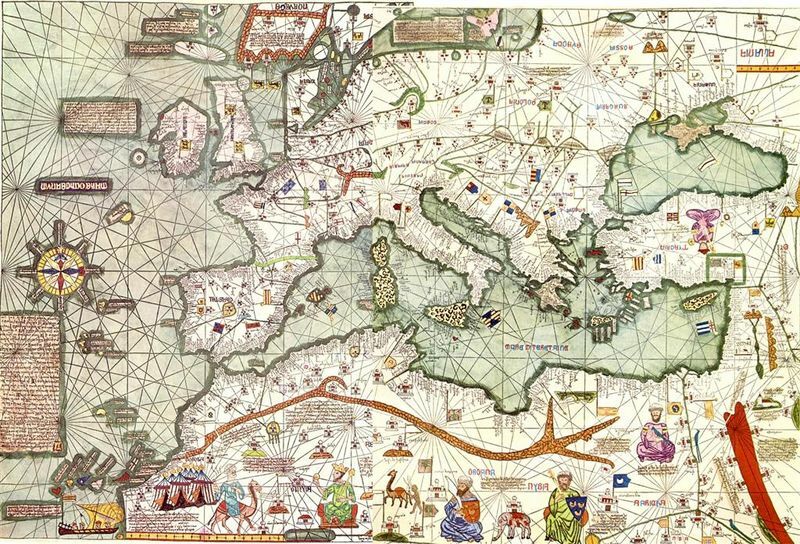 The Catalan Atlas (1375) is the most important Catalan map of the medieval period. It was produced by the Majorcan cartographic school and is attributed to Cresques Abraham (also known as "Abraham Cresques"), a Jewish book illuminator who was self-described as being a master of the maps of the world as well as compasses. It has been in the royal library of France (now the Bibliothèque nationale de France) since the time of Charles V. The Catalan Atlas originally consisted of 6 vellum leaves folded down the middle, painted in various colors including gold and silver. The leaves are now cut in half. Each half-leaf is mounted on one side of five wooden panels. The first half of the first leaf and the second half of the last leaf are mounted on the inner boards of a brown leather binding. Each measures approximately 65 × 50 cm. The overall size is therefore 65 × 300 cm. Detail of Catalan Atlas, the first compass rose depicted on a map. The first two leaves contain texts in Catalan language covering cosmography, astronomy, and astrology. These texts are accompanied by illustrations. The texts and illustration emphasize the Earth's spherical shape and the state of the known world. They also provide information to sailors on tides and how to tell time at night. The four remaining leaves make up the actual map, which is divided into two principal parts. The map shows illustrations of many cities, whose political allegiances are symbolized by a flag. Christian cities are marked with a cross, other cities with a dome. Wavy blue vertical lines are used to symbolize oceans. Place names of important ports are transcribed in red, while others are indicated in black. Unlike many other nautical charts, the Catalan Atlas is read with the north at the bottom. As a result of this the maps are oriented from left to right, from the Far East to the Atlantic. The first two leaves, forming the oriental portion of the Catalan Atlas, illustrate numerous religious references as well as a synthesis of medieval mappae mundi (Jerusalem located close to the centre) and the travel literature of the time, notably Marco Polo's Book of Marvels and the Travels and Voyage of Sir John Mandeville. Many Indian and Chinese cities can be identified. The explanatory texts report customs described by Marco Polo and catalogue local economic resources, real or supposed.